Smartphones have truly revolutionized our life. But due to intense competition among smartphone manufacturers, it becomes difficult to find the best in your budget. Today we’re here with two smartphones, Asus Zenfone 3 Max & Vivo V5 which lies above Rs. 15,000 segment. Taking about the companies, Asus is a Taiwanese company which is majorly known for it’s premium products whereas Vivo is a Chinese company managed by BBK Electronics, the same company which manages Oppo & OnePlus. 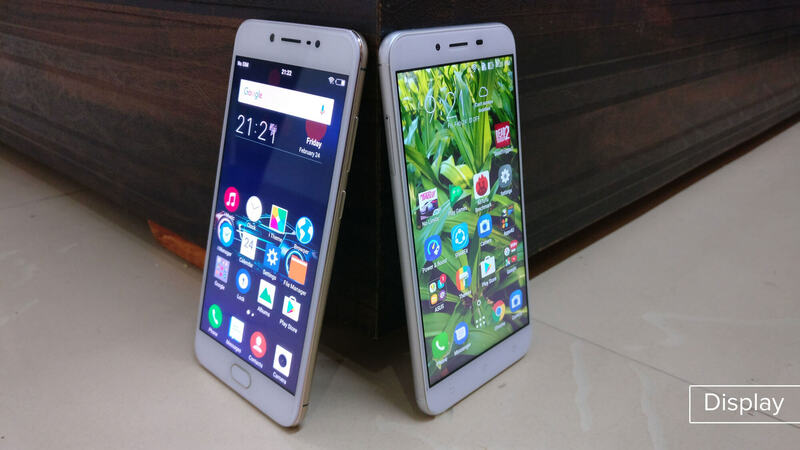 In this review, we’ll check which smartphone outperforms the other in every aspect i.e Quality, Hardware, Softwares, Battery & design. It’s showdown time! The Asus Zenfone 3 Max comes with a Metallic back & plastic Top and bottom. Whereas, the Vivo V5 comes with a complete plastic body. The Zenfone 3 Max does feel premium in-hand, because of its metallic finish & ergonomic design. The device feels heavy (175g) in comparison with Vivo V5 (154g) because of it’s huge battery & metallic body. The Vivo V5 is a shameless ripoff of Apple’s old iPhone designs, which does makes it look better but the Plastic body ruins it. The Vivo V5 seems to be made of cheap plastic & doesn’t feel good in hand. After paying almost around Rs. 18,000, you don’t get that “Premium in-hand feel” from the Vivo V5. 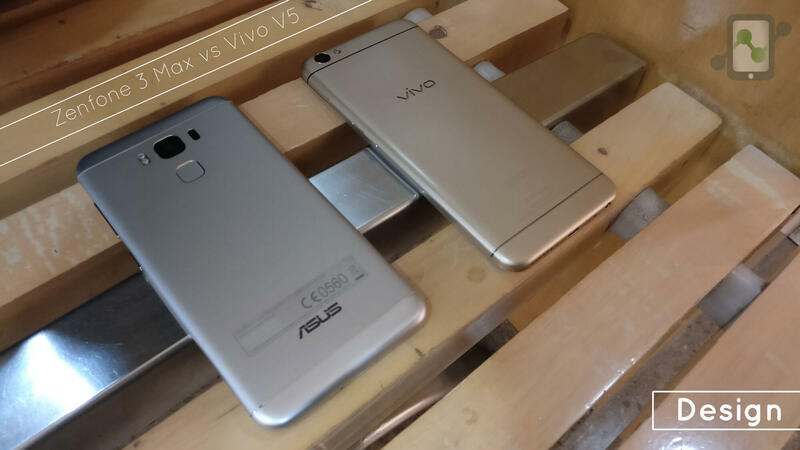 At the back of Vivo V5 we have a “vivo” branding crafted inside the back cover, which does look more appealing as compared to the printed “Asus” logo on Asus Zenfone 3 Max. Both the devices get thick Antenna lines which don’t seem to bother me. The Vivo V5 plus has the fingerprint scanner at the front, which I prefer. Whereas, the Asus Zenfone 3 Max has the fingerprint scanner at the back which just doesn’t respond sometimes (Might be the case with my unit only!) At the bottom, both the devices have a mono speaker & a USB charging slot. 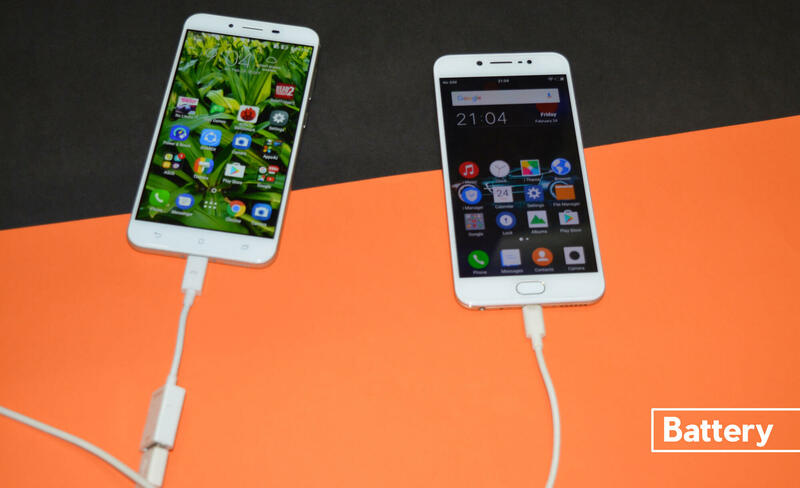 While the Zenfone 3 Max has the headphone jack at the top, the Vivo V5 has it at the bottom. Overall I would prefer the Asus Zenfone 3 Max design over the Vivo V5 because of it’s premium metallic feel & finishing. The Asus Zenfone 3 Max has a 1080 x 1920 display while the Vivo V5 has a 720 x 1280 pixels display. This means, the Zenfone 3 Max has a much better display with full HD resolution. The color reproduction on the Asus Zenfone 3 Max is much better & both the devices have great viewing angles. Only problem here is, the Zenfone 3 Max has a yellowish tint on it’s screen which you can notice while viewing images or in camera app. The worst part is, there’s no screen calibration option in the Zenfone 3 Max. The Vivo V5 is a clear loser for that 720p display at this price. We atleast expect 1080p display for this price. But the Vivo V5 offers Corning Gorilla glass protection which seems missing in Zenfone 3 Max. Ofcourse I would prefer a better looking display over Gorilla glass. 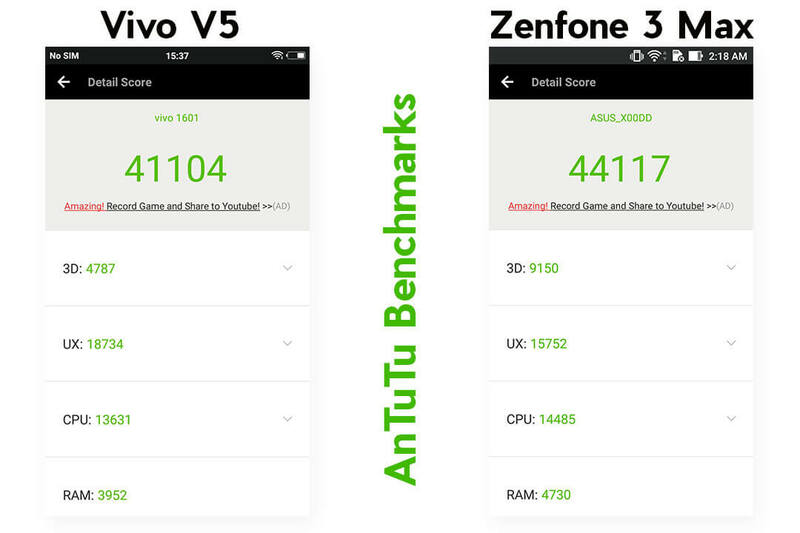 The Zenfone 3 Max houses a SD430 Octa-core CPU clocked at 1.4Ghz, while the Vivo V5 offers Mediatek MT6750 Octa-core CPU clocked at 1.5Ghz. Both the smartphones have 8 Cortex A53 cores but the Vivo V5 has something different to offer, 4 cores assigned for intensive tasks (also known as Primary CPU) while the other four for normal task (also known as Companion CPU) to save power. Even if the both the devices has almost the same specs, the Vivo V5 does lag & feel sluggish because of it’s FunTouchOS. In terms of performance, the Zenfone 3 Max can handle more tasks as compared to Vivo V5. Although both the devices have similar specs, it could have been better; at least for this price. Both the devices run Android Marshmallow out of the box with their own custom skin. 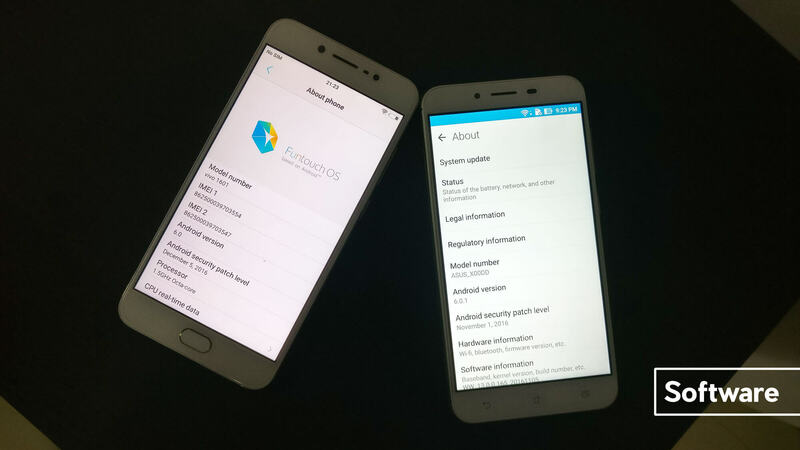 The Zenfone 3 Max has ZenUI and the Vivo V5 has FunTouchOS 2.6. The FuntouchOS is very much similar to iOS design & not well optimized. The FunTouchOS is probably the worst Android skin that ruins the entire Android experience. Few features like, pulling down the notification bar while the device is locked, is disabled in Vivo V5. On the other hand, Zenfone 3 Max running the ZenUI seems close to stock Android with minimal changes. The ZenUI offers some Asus apps which are pretty useful for better RAM management. But the ZenUI does look pretty outdated, the design and Animations. Both the devices has custom Animations that does slow down the process & you might feel lag while switching through apps. I would still prefer Stock Android over custom Skin. 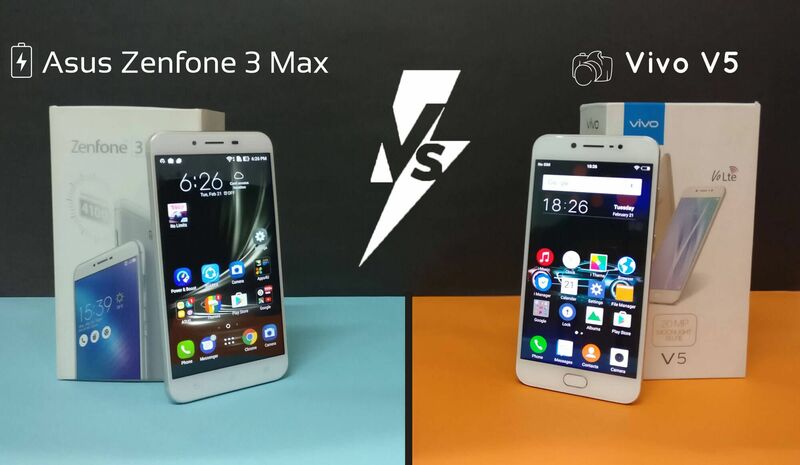 But if I were to choose one among this two, Zenfone 3 Max would be my only choice. The Zenfone 3 Max has 16MP rear camera with dual LED flash & 8MP front camera. Whereas, the Vivo V5 has a 13MP rear camera with flash and 20MP front camera with flash too. The Vivo V5 has much better cameras as compared to the Zenfone 3 Max. The images seem to be more natural & colorful in Vivo V5 shots while the Zenfone 3 Max camera images lack colors. The front camera of the Vivo V5 has no comparison as it captures some really clear images even in low light. The Vivo V5 known for it’s camera, surely has the best camera of the two. But, the rear camera of Vivo V5 does struggle in low light condition similar to the Zenfone 3 Max. 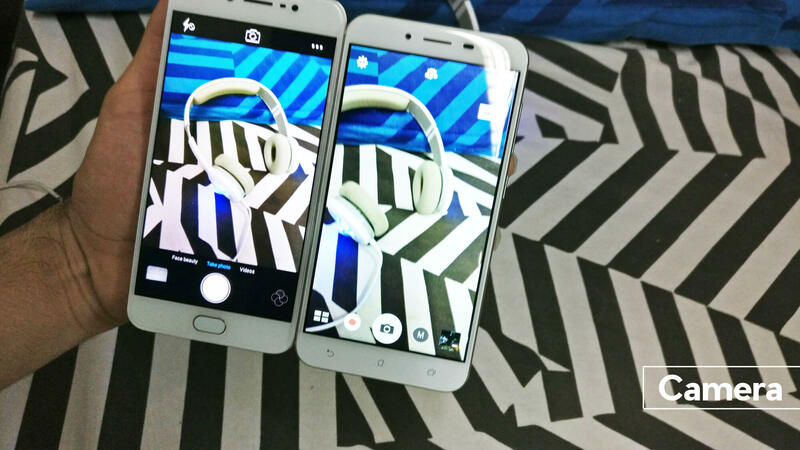 Here are some of the image comparison of Zenfone 3 Max & Vivo V5. The Asus Zenfone 3 Max surely doesn’t need any introduction in the battery department. But for the specs, the Zenfone 3 Max houses a massive 4100mAh battery. Whereas, the Vivo V5 has a 3000mAh battery. Both the devices have non-removable battery with no fast charging support. The Asus Zenfone 3 Max at full charge lasts for about a day and half on heavy usage. It is surely the beast that the Max series is known for! The Vivo V5 on the other side, with 3000mAh battery offers decent battery life because of it’s companion cores that remain unused to save power. Both the device offer good battery life but due to big battery size, the Zenfone 3 Max has more to offer. I got around 5.5hrs of Screen on time (SOT) on the Zenfone 3 Max whereas around 3.5-4hrs of SOT on the Vivo V5. Both the phones, Zenfone 3 Max & Vivo V5 are bit overpriced as per the specs they offer. But to be honest, the Zenfone 3 Max is a clear winner with beautiful design & that big battery life, it is surely worth your money. But if you’re more into photography, Vivo V5 would be the perfect choice. Which would you buy? Let us know in the comment section.